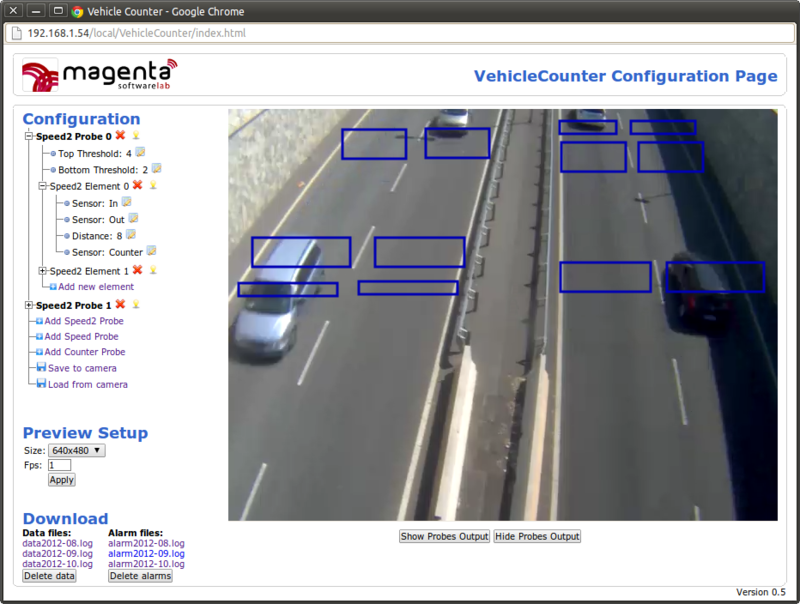 Vehicle Counter is a traffic monitoring application developed on the Axis Camera Application Platform (ACAP). It can be installed on most of the ACAP-enabled Axis camera server (such as the P33 camera servers), and it is capable of collecting meaningful statistics regarding the number of vehicles passing through the observed lanes, their length and speed. The application allows the user to set a number of virtual sensors and to decide how to aggregate the collected data. Sensors configuration can be made by means of a web application which is installed on-board and served by the camera web server. Statistics are stored on-board in the internal memory or SD card, and made available for download via a simple REST web service interface. The video below shows an example of the configuration process for a street with two lanes. Real time count and speed estimate for each monitored lane. Unlimited number of monitored lanes. Vehicles classified according to their length in motorcycles, cars, heavy vehicles. Robust to different light and weather conditions. No hard requirements on camera height or angle. Can store data on optional SD card with a programmable time schedule. Powerful web services API based on REST and JSON standards for system integration. Wrong direction, queue and stopped vehicle events available. The system configuration can be made by means of our web interface, that allows to place virtual sensor, configure distances between the sensors, check online vehicles detection and download collected data. Data collected by the Vehicle Counter application can be downloaded from the configuration web interface or be transmitted automatically to a remote server by means of REST/HTTP web services. 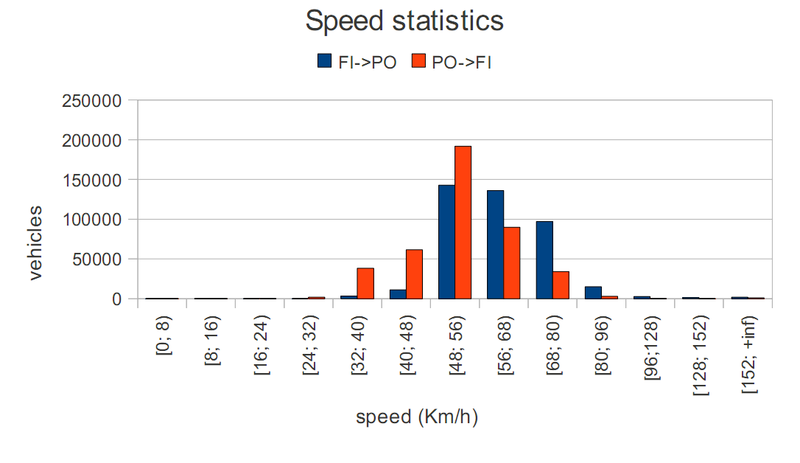 Below, two examples of vehicles statistics are reported, both coming from our prototype installation. The first figure shows the plot of vehicle per minute against time of day for the two ways of a four-lane road. 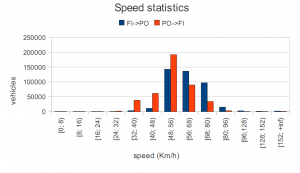 The second figure shows the estimated speed distribution on the same road. The EAP package for the latest version of Vehicle Counter can be downloaded for several Axis camera server based on ARTPEC-3 or ARTPEC-4 microprocessors (links below). In order to become fully functional, Vehicle Counter needs a commercial license that can be required at magenta@magentalab.it. But you can also try it on your ACAP enabled camera for 30 days. To do this, visit the page www.axis.com/techsup/compatible_applications and select “Get trial key”. Choose “VehicleCounter from Magenta srl ver. 1.1” in the combo-box and enter the serial number of your Axis camera. You will receive a trial license key that can be installed onto the camera and will allow Vehicle Counter to run for a 30-days trial. Any feedback is highly appreciated (magenta@magentalab.it). At the moment the following Axis cameras are supported: M320*, P134*, P330*, P334*, Q191*, Q192*, Q8721, M501*, P551*, P552*, P553*, P5544, Q603*, M105*, M110*, M3014, M111*, M311*, P134*, P3346, Q175*, P12**, M2014, M3006, M3007, P335*, P336*, P135*, Q160*. In case your camera is not in the list, contact us (magenta@magentalab.it). Several AXIS camera servers with firmware version older than 5.40 are affected by a bug that prevents the user from installing ACAP applications that make use of certain system libraries (specifically, the fixmath library). The bug can only be fixed by Axis (which is informed) by distributing a new firmware version for the user to install. In the meantime, we developed our own workaround to allow our customers to use our Vehicle Counter application on their Axis camera even in the presence of this bug. Our workaround is distributed in the form of a separate ACAP application, called Magenta Patch. It does not need any license and is freely downloadable here. The linked package is for ARTPEC-3 cameras only. ARTPEC-4 cameras are unlikely to be affected by this issue since their firmware is usually newer. However, do not hesitate to contact us in case of problems during Vehicle Counter installation. If the installation of Vehicle Counter fails, first try updating to the latest firmware version. If this does not fix the problem, try installing Magenta Patch and then re-install Vehicle Counter. Note that there is no need to run Magenta Patch. It is enough to keep it installed onto the camera. This will allow Vehicle Counter to install and run correctly. If you are a developer of ACAP applications, you may want to use Magenta Patch to enable the workaround for your own applications. In this case, you can ask for support by writing an e-mail at magenta@magentalab.it. What follows is a list of known issues and common problems you may encounter while trying to use Vehicle Counter. If you experience a problem that is not listed here (or even if it is listed) write us at magenta@magentalab.it. Google Chrome file upload bug. There is a known bug in Google Chrome that sometimes causes a file upload to fail with the error message “Could not upload package file, the file is too large or disk full”. This may occur while trying to upload the Vehicle Counter or Magenta Patch EAP package to the camera. Unfortunately, this is not something we can fix, so the only fix we can suggest at the moment is to try with a different browser. Failed EAP package installation. If the package upload complete successfully but the camera refuses to install the application, you likely need Magenta Patch. See above for details. Failed license key installation. If the application package successfully installed onto the camera but you cannot get a valid license key, it is likely that your camera is not compatible. Check if your camera model is in the list of supported camera models. Remember that Axis camera servers can run only one application at a time. If there is another application running on the camera, you need to stop it before starting Vehicle Counter. Re-flash firmware (same version currently in use). Flashing a new (or old) firmware does not remove installed application, so you will not need to reinstall them. If it is available, try upgrading the firmware with a newer version. Flashing a new (or old) firmware does not remove installed application, so you will not need to reinstall them. If everything else fails, try downgrading your firmware to an older version. Flashing a new (or old) firmware does not remove installed application, so you will not need to reinstall them.